Mini-implants are a new technology that offers a less-expensive alternative to standard dental implants. 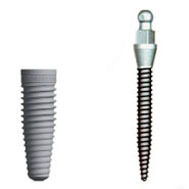 Because they are smaller (about a third of the diameter of standard implants), mini-implants don’t require as extensive a surgical procedure as standard implants. In some cases they can be placed and loaded (the artificial teeth placed on top) on the same day. However, their small size also means they are not suitable for all patients who need dental implants. They are not as sturdy as standard implants and are more prone to failure if placed under too much stress or pressure. An alternative that has worked for many patients is to use mini-implants to anchor a removable denture. The implants are placed and then a denture can “snap on” to the implants. This prevents many commonly reported problems with conventional dentures, such as slippage and poor fit. If you would like to know if you are a candidate for mini implants, call us to schedule an appointment, or request an appointment online.